Renate Reabel, of Ontario, Canada, was looking out her back window last December when she saw something moving in the pool. 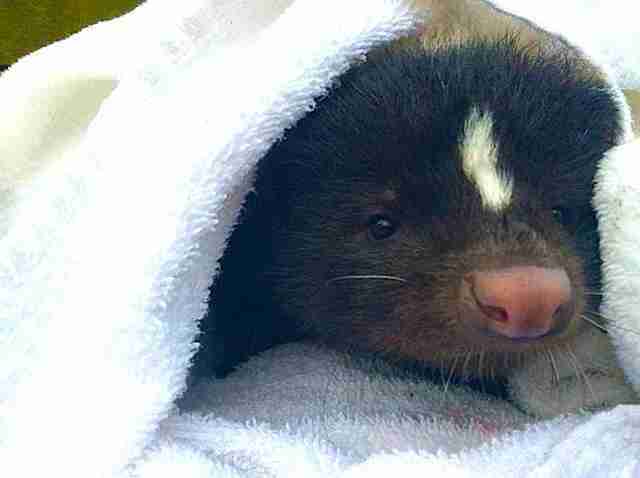 "I rushed out, grabbed the leaf scooper and pulled out a large skunk in very bad shape," Reabel told The Dodo. "He had clearly been in the water for a long time." 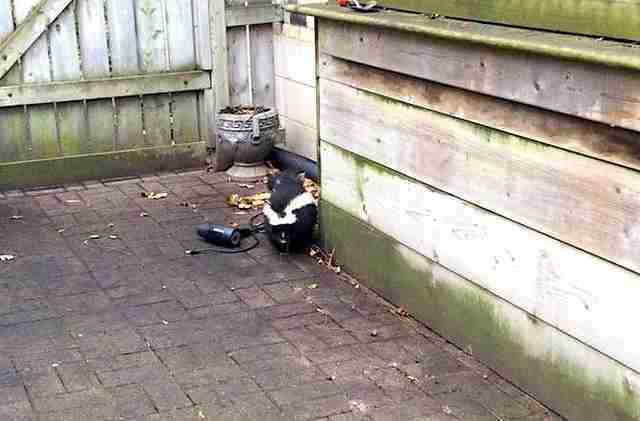 The concerned human put the skunk on the deck to dry off. But the weather was a bit chilly - and she knew she couldn't just leave him there. "He could barely lift his head," Reabel said. "If I had left him he surely would have died of hypothermia." Reabel rushed inside for supplies. 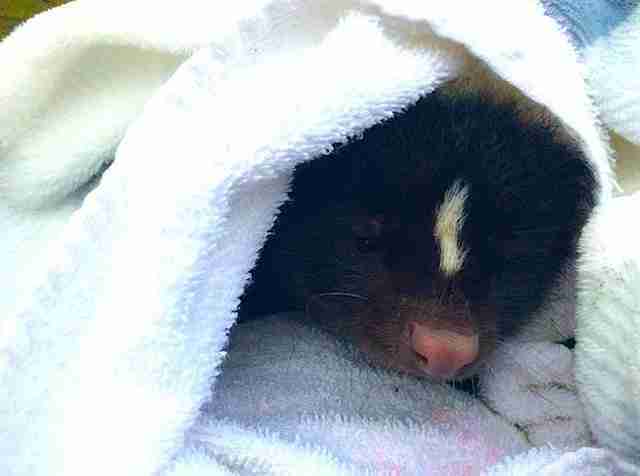 What do you do for an exhausted skunk who you just pulled from your pool and who is now reclining on your back deck? Reabel figured a towel and a warm blanket would help. She also grabbed some berries and honey, to tempt him back to life. "I sat for about an hour cradling and warming him up," Reabel said. "I was worried, I didn't think he was going to pull through. 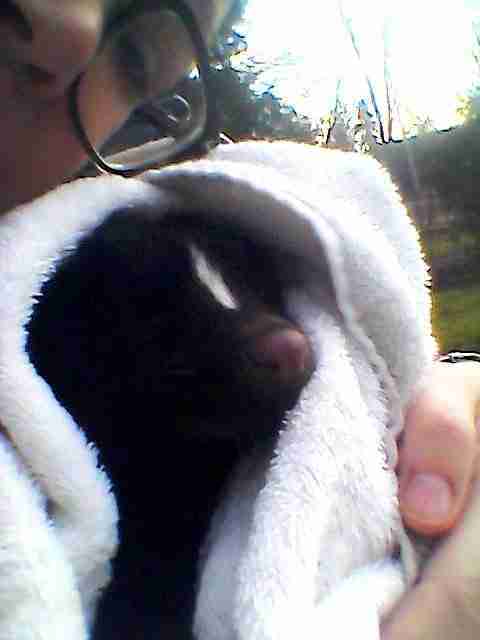 This full-grown wild skunk was allowing me to cuddle and rock him ... I figured this was not good." But Reabel didn't give in to her doubts. She stayed with him. 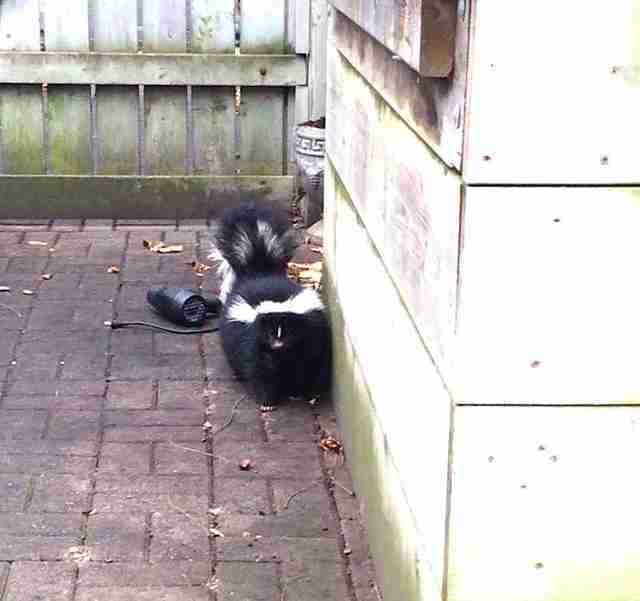 And soon the skunk started to get "a bit squirmy." This was a good sign. "I lay him down on the grass and brought out a hot bottle for him to lay on," Reabel said. She then stood watch a few feet away. After another 45 minutes, he started to come back to life. Reabel breathed a sigh of relief. "He picked himself up, pulled himself out of the warm towel cocoon, ate the berries and honey I left for him, then took off. Reabel still managed to snag a selfie with the visitor before he left. "I really can't believe he survived," Reabel said. "I honestly did not think he would make it."